These stories are somewhat interesting cases. Many people who are low-income look after their animals very well, better than themselves in many cases, and it should not be construed that if you are low-income that you do not look after your animals. As veterinary care costs money, we are constantly fundraising for this project. If you would like to help, please donate via charge card on our home page or send a check payable to the Humane Society to 8304 Wayne Ave, Stanwood, WA 98292. We also have "Pet Guardians" who are emailed when a case comes in. If you would like to sign up as a "Pet Guardian", please email hmnsoc@aol.com with your email address. Two 2-year old pit bulls were left at a foreclosed house. Fortunately a neighbor noticed and fed them. She came to the shelter for help and we provided food and medical care. They are still looking for a home. Man called as his dog had jumped in the air and then could no longer move. He could find no one in two days to see his dog as he had no money. He found us two days later. As his dog had been in a lot of pain, we authorized a visit to the emergency vet immediately. There was extensive damage and sadly he had to be laid to rest. Man called at end of the month as he had no money to buy dog food and no transport. We delivered allergy dog food to him that afternoon along with shampoo and a dog bed. Lady called with sick kittens. We authorized a visit to the vet. However, she left them at the vet so we took them back to the shelter. Man's wife died and he didn't look after her small dog. It was a farm and the dog eventually couldn't move due to mud and cow dung. He was given up and we found him a new home. As it was Christmas, we called him "Chris." A disabled lady called in crying because she had no money to buy her cat food and would not get any money until the end of the month. We delivered her 3 months' supply of dry and canned cat food that evening. A homeless man drove into the food bank with 4 large dogs in his enclosed truck. We learned they have been living on bread he had obtained from local food banks. We gave him a lot of food for his dogs. 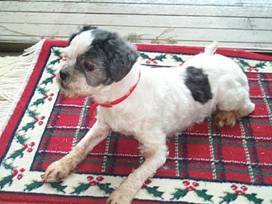 Two of our clients' dogs got into a fight and one was badly injured. We arrange for our vet to take care of her. Later we spayed both of her dogs. A family had two dogs, a small poodle and a pit bull. They got on well but during a play session the 5 lb poodle's leg was broken. It was their own decision to give up the small poodle rather than the pit bull, knowing that she had a better chance of adoption. The poodle's leg was broken in three places and had to be amputated. A man came into the food bank saying he thought his dog had a broken jaw, either during a dog fight or being hit by a neighbor's horse. In addition to his broken jaw, the dog was in poor condition. The prior year, this man had also had a dog with a broken leg. He agreed to give the dog up. 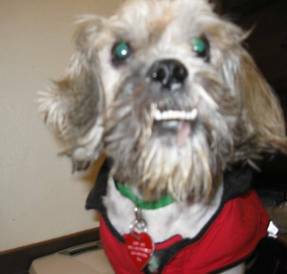 This Lhasa Apso was taken to the emergency vet for x-rays and the jaw was later repaired. We took dog food, and also people food, to a homeless lady on the streets. With the help of a QFC grant, we also boarded her at a hotel during the winter months. She was a former teacher who now had schizophrenia. We tried so hard to help this lady and her large dog but she refused all help. Her brother also tried to help but to no avail. To our knowledge, she still lives on the street. We do know that her dog died. A lady bought in a terrier mix with three puppies. 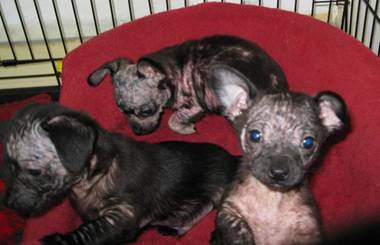 All had bad mange with almost no hair. It took 6 months to get them to a point where they were adoptable. 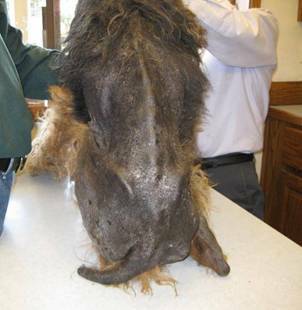 A man's dog had a very large stomach tumor and was shivering, coughing and having trouble breathing. He had no money to see a vet sooner. Sadly when the dog did see our vet it was too late. A man visiting our food bank, told us of a small dog with a broken leg owned by his neighbor. This dog had received no treatment for a week. We visited this neighbor to find he had no funds to go to a vet. He wanted to give up his dog and so he signed her over to us. She had surgery and her leg was pinned. A few months later she was spayed. One of our vet's assistance fell in love with her and adopted her. Health Department told man with multiple cats he had to reduce their numbers. As many were not socialized, we, and other no-kill groups, picked many up. They were then spayed/neutered and many found homes. We are always looking for situations for feral cats or people to help trap them. Two cats were left behind in a rental home. Eventually found by landlady in poor condition. We arranged for these cats to see our vet and later be spayed. Landlady fell in love with them and kept them! Dog had a cyst on its front leg which he was licking continuously. We arranged for this dog to see our vet. A man called from the Olympic Peninsula saying his dog was very sick and he hadn't any money to put it to sleep, nor could he pick it up to put it in his car as it was too heavy. He had called the police and fire department and no one would help. We arranged with a local rescue to take the dog to a vet. We paid for his final expenses. A lady called asking us to pick up her dog. She hadn't the money to feed it. 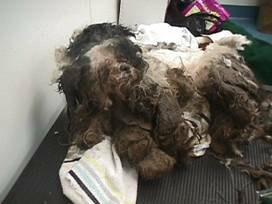 One of our volunteers went to pick up the dog and it was in an awful condition. We had no option other than to lay it to rest. We wish we could advertise further about our food bank but the need is so great that we would be overwhelmed. Man couldn't afford flea control and so he had been putting brewer's yeast and flea powder on his dog. Poor dog had an allergic reaction and his hair fell out. We gave a vet visit and provided Frontline for future use. Lady in foreclosure gave us 10 of her dogs when she had to move out of her home. We spayed/neutered everyone, including her own dogs and her sister's dogs. One dog was pregnant and we kept her until after the birth of six beautiful babies. 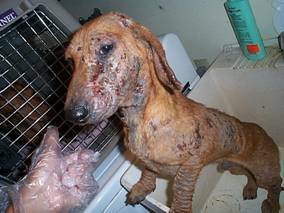 A family member brought in two dachshunds who had been used for breeding and who had mange. One had bad infection over his entire body. It took a long time but his skin eventually did clear up and she was adopted. We called them Handsome and "Great"el. Poodle being fed people food, mainly chicken breasts, nothing else. With the lack of doggie vitamins this dog eventually could not walk. As Grandmother had dementia, her family decided a dog was too much for her. Once on regular dog food, the dog did well. A lady called to say her renter was making her dog homemade food and the dog was very weak and could hardly walk. She reported this to animal control and the police but they said it is not against the law so they could do nothing about it. We gave her educational materials to give to her renter. A poor cat's tail was shut in a storm door making the bone protrude. Her people couldn't afford to go to a vet. We arranged for cat to have surgery at our vet.